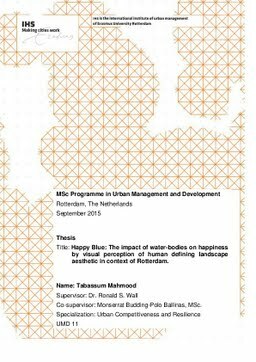 Erasmus University Thesis Repository: Happy Blue: The impact of water-bodies on happiness by visual perception of human defining landscape aesthetic in context of Rotterdam. Happy Blue: The impact of water-bodies on happiness by visual perception of human defining landscape aesthetic in context of Rotterdam. In 2050, 70% of the expected world population will concentrate in cities creating pressure on land planning and resource management. Already, the cities of the world are taking different initiatives and projects within their economic capacity to address the challenge. Economic and Financial assessments are done to prioritize the projects and ultimately those assessments become the decision tools. The conventional practise of cost-benefit analysis faces methodological challenges in case of assessing cultural eco-system service because of their non-marketable economic benefit. Due to this difficulty, within the assessment process some vital criteria remains unaddressed and the benefits associated with them lacks internalisation. As a result those services are devaluated, making them vulnerable in case of management and protection. Therefore, the driving decision maker of development projects mainly considers the objective wellbeing issue and subjective gain of Human remains unnoticed. The main objective of this research is to find out a solution and built up a model to assess this intangible good. Aesthetic service of Eco-system services needs human perception and for measuring human perception the model that has been formulated for this research has taken “Water-body” as an example from the landscape elements and to assess its aesthetic service “Happiness” has been taken as the measuring scale. Consulting Aesthetic theories it has been understood that Aesthetic services are not dispersed randomly across a landscape, but rather follow particular patterns in terms of the intensity, richness and diversity in their provision resulting hotspots and cold-spots in urban landscape. Therefore, the possibility of measuring them can be realized. Consulting and going through the previous researches conducted regarding landscape aesthetics and human perception three measurable indicators, i.e. availability, accessibility and acceptability were isolated to valuate aesthetic service in urban landscape. Therefore, the main objective of this endeavour was to explain how the availability, accessibility and acceptability of water-bodies through aesthetic service impacts happiness on the ground of “Need gratification”. Due to availability of data from “The municipality of Rotterdam” the opportunity to conduct the research has been materialized. This was an “Explanatory-Quantitative Research”, as the subject matter is “Unconscious Happiness” the result can be generalized for the human race but not only from theory from research strategy the generalizability needed to be induced. Therefore, survey as research strategy has been taken and a massive volume of data were analysed to draw conclusion.